I don't know why this is happening, but it is and it's frustrating. It seems that every custom texture in every map I try and port doesn't work. I have extracted the textures from the map using GCFScape to my tf/materials folder and this issue still occurs. Everything using a custom texture comes out as these white blocks for some reason. I think that nor hammer or your game can have access to these textures. Does it do that for only textures? Does it do that for maps with custom sounds, models or other custom things? Are you sure you don't have like a backup or a duplicated version of tf2 on your harddrive that you are copying files to instead of the game that is being executed? Are you using SourceSDK hammer or directly the hammer.exe file in your common/Team Fortress 2/bin directory? Can you give me more informations? Shadow Sheep wrote: I think that nor hammer or your game can have access to these textures. I believe it only happens with the textures. I don't have a backup version of tf2 I'm copying to, and I'm using the hammer version from the bin directory. I think I might be doing the extracting wrong. I always extract both the lumps and materials folders from GFCScape to tf/materials, and the textures just end up not working. 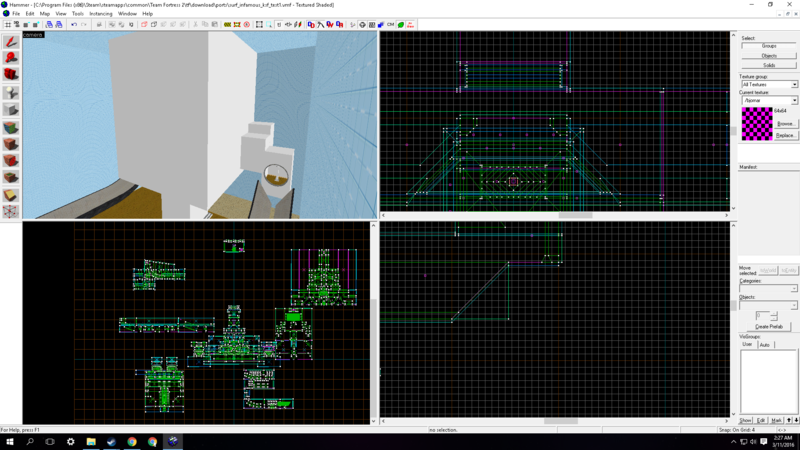 I used to think it might be the mapper packing the map wrong, or downloading a broken .bsp, but since it's happened with all the maps I've tried to port except for junglespic I don't think that it's the issue anymore. Something possibly noteworthy is the fact that when I compile the map using VBCT the textures come out as the famous pink and black checkerboards. I went to the 'check for problems' tab, and saw a whole bunch of invalid textures. When I click the fix button, the texture transforms into the pink and black checkerboards. You should not extract the lumps as they are not used in the editor to manipulate the map. They are more of a result of a compilation of the map than a material intentionaly packed int he mapitself. I never tried to extract it, so i don't know if that is the reason you are having issues, but I don't think it would hurt to try. Typically though, your editor is behaving like if there was clearly none of the custom textures you have extracted. 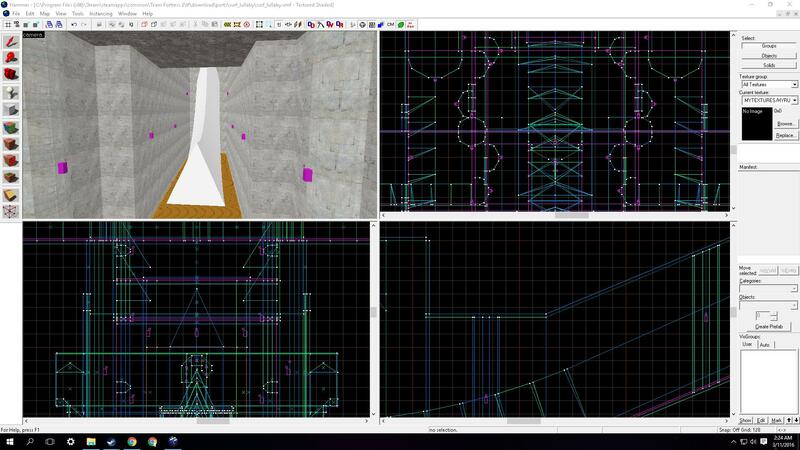 Try to go back to nasty's tutorial on porting a map and see if there isn't a step that you did differently and that could explain the result you are having. Removing the lumps folder and extracting just the materials folder did not work. I did change all of the errors of that type though, so now every missing texture actually shows up as the 'missing texture' texture. But the question still remains, why are they even showing up as missing textures anyway? I should have had all of them when I extracted the files in the first place. Note down the name of one texture you extracted and its path relatively to the materials folder. 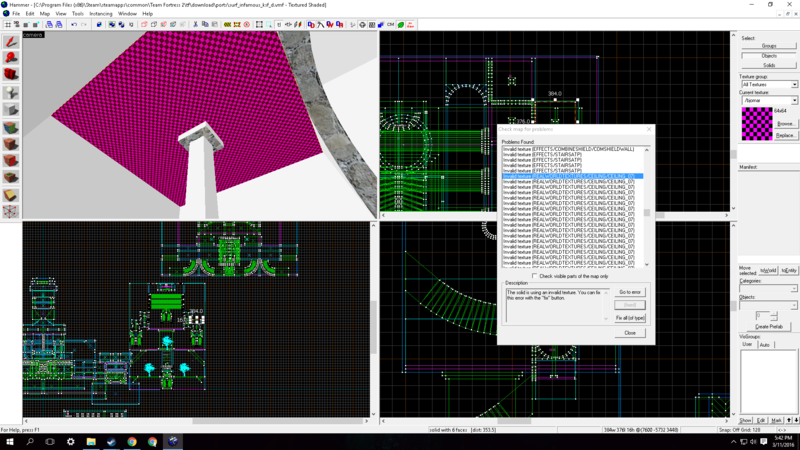 Then, in hammer, go in the texture application tool and click browse. If you cannot find your texture, then it means hammer won't be able to load it. Plus if you cant see them in game either, it means that not even the game has access to them. Shadow Sheep wrote: Does it do that for only textures? Does it do that for maps with custom sounds, models or other custom things? I meant can you even load any custom things like sounds and models from maps? Or even materials coming from the internet? Make sure you drag and drop the "materials" folder in the "tf" folder, and not like inside materials or anything else. Please screeshot me where you put your files. I need to understand what is going on. Fixed, thanks to Sheep pointing out my dumbness.